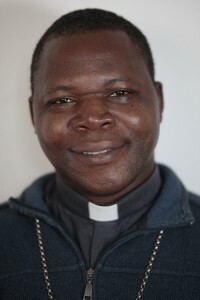 The Catholic leader of the Central African Republic embodies his Church’s commitment to peace and national reconciliation. Archbishop Dieudonné Nzapailanga, the president of the bishops’ conference and archbishop of the capital city of Bangui, recently visited a camp where former members of the Seleka Muslim rebel militia are housed, along with their families. For several years, the fighters of this now-dissolved militia committed many atrocities, targeting especially the Christian population of the country. Archbishop Nzapailanga was accompanied during his visit by representatives of Catholic aid agencies, who brought food and hygiene articles into the camp as well as medical aid. The archbishop spoke with the former rebels and listened to their needs. The ex-Seleka fighters are worried about their reintegration into society and expressed uncertainty about the future of their children. Archbishop Nzapailanga appealed to them not to resort to arms again. Ahead of his visit, in their Advent pastoral letter, the episcopal conference appealed to Catholics in the Central African Republic to work for reconciliation. “Even if a genuine and lasting peace is a gift of Christ, nonetheless it depends on each one of us also,” they wrote. The security situation in the Central African Republic remains highly unstable. There are continuing and repeated outbreaks of violence. According to the UN, more than 852,000 people are still displaced, having been forced to flee their homes – a figure that corresponds to one-fifth of the total population of the country. In 2015, the transitional president, Catherine Samba-Panza, is due to hand over the reins of government to an elected successor. However, observers are now assuming that the elections will not take place in February, as planned, but in the second half of the year. More than 5,000 people have died in sectarian violence in Central African Republic since December 2013, with Moslems fighting Christians. However, the bishops have consistently stressed that the conflict was not a religious one, but rather a confrontation encouraged by Islamist forces outside the country and involving land-holding farmers Vs nomadic peoples.